Add the bundle to your basket free of charge. Note that our normal minimum order applies so you will have to make an appropriate purchase. This does not have to be downloads but can be anything in our shop. After completion your free download link will appear in your confirmation email. The link is valid for 72 hours. Sorry but we cannot send the bundles after your purchase if you have forgotten to add them. All files are bundled and zipped. You will need WinZip or another unzipping utility to unpack the files. Our normal terms apply for the free downloads also. 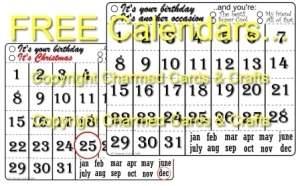 Karen has created a handy calendar for you to use on cards and layouts. As an added bonus she has included a seperate calendar specially for Christmas especially for your Christmas projects. Our normal terms apply for the free downloads also. Please read important information above.